The Drake ACT1000 is designed to transcode one 8VSB/ATSC broadcast channel to a single QAM output channel. It may also be used to translate or process a single QAM channel on its original input channel assignment or to a different QAM output channel. Simplicity and affordability are the end result of this new product from Drake that is in a card form factor and integrates into Drake’s popular RMT150 chassis and is powered and controlled by the PS151 power supply allowing up to 10 ACT1000’s to fit into 2 rack spaces (3.5″). Drake’s ACT1000 is the logical choice for transcoding ATSC broadcast channels to QAM for distribution on any RF cable type system where sufficient bandwidth is available and the added cost of multiplexing two ATSC channels to one QAM channel is prohibitive. Additionally, Drake’s ACT1000 system is the densest configuration currently available with the ability to house 10 transcoders in 2 rack spaces. Customers using Drake’s popular SCTx860 series satellite to QAM transcoders may mix and match satellite and ATSC transcoders in the same chassis for maximum flexibility and cost savings. The ASII module is for use in the MEQ1000A. One module provides one DVB-ASI SPTS or MPTS input for the MEQ1000A. One or two ASII modules may be used in a MEQ1000A. Using the ASII module, programs may be input to the MEQ1000A where they will be program filtered, retimed, and multiplexed with programs from the other input module. The ASII module can accept data rates up to 80 Mbps. Possible sources are satellite IRDs, output from a fiber link, encoders, terrestrial demodulators, video servers and other related equipment. The ASII also provides an ASI output which provides a looped out copy of the ASI stream coming into the ASI input port of the same ASII module. The R.L. Drake CRF series of Channel Removal Filters will effectively remove a 6 MHz television channel allowing the subsequent insertion of alternate programming in the same location. Degradation of the adjacent channels below and above the subject channel will be minimal. These units are custom configured to remove the channel(s) specified and the actual response plot will be provided with the unit. The CRF550 has a passband to 550 MHz while the CRF750 and the CRF1000 have passbands to 750 MHz and 1000 MHz, respectively. Available for most standard channels. Specify stopband edges desired. Rejection >50 dB over the entire stopband. Low loss on adjacent channels. 550 MHz, 750 MHz, and 1000 MHz passbands available. These units are custom configured to order and are quoted to your specific requirements. The Drake DAV860 Digital to Analog Decoder provides digital demodulation and decoding, for ATSC 8VSB broadcast or in-the-clear QAM television signals. The DAV860 delivers a standard NTSC composite analog video and stereo audio output. Used in conjunction with an analog NTSC modulator, this product allows a cable system operator to continue to provide analog versions of services that will only be available to him as digital in the future. It may also be utilized to provide the alternate digital channels now available from many broadcasters. The decoder makes no change to the image format if the digital signal received is transmitted in 480i. If the signal is high definition, 720p or 1080i, options are given to either crop or “letterbox” the 16:9 proportioned image into a 4:3 format for output. The DAV860 is AFD Ready. This means that the DAV860 supports automatic aspect ratio control through the Active Format Description metadata that may be broadcast with the video. AFD control may be overridden if desired. The R.L. Drake DDC864A is a low noise downconverter designed for translating digital ATSC, 8VSB signals from their off-air channel to a 44 MHz IF output. The output of the DDC864A can be connected to a DUC series upconverter to place the digital signal on a new output channel. When the DDC864A is used with the DUC864, “on channel” conversions, (the same input channel on the DCC and output channel on the DUC) are acceptable. The DDC864A provides low noise figure and low phase noise as well as a flat passband to minimize signal deterioration. The DDC864A is optimized for use with ATSC 8VSB modulation in a 6 MHz wide channel assignment. The passband is designed for optimized operation with 8VSB signals in an adjacent channel environment. For translation of QAM signals, the Drake model DQT1000 is preferred for this task. The Drake DNP100 is a multi-output network media player capable of playing multi-layered MPEG-2 or MPEG-4 streams. Once loaded with content, the DNP100 will output video stream resolutions of 480p, 720p, or 1080i through multiple synchronized outputs including Component, HDMI, Composite, and VGA output ports. These output ports then deliver the enhanced bit rate SD or HD content to the Drake DSE24 HD Digital Signage Encoder, the SDE24 or HDE24 MPEG Encoder Solution for QAM Modulation. The DNP100 includes the Drake Digital Signage Manager content management software. The Drake DNP50 / DNP50 AVW is a High Definition Android® platform-based network media player capable of playing multi-layered MPEG-2 video streams. Once loaded with content, the DNP50 / DNP50 AVW will output video stream resolutions of 480p, 720p, or 1080p through its HDMI output port. This output port then delivers the enhanced bit rate SD or HD content to the Drake DSE24 HD Digital Signage Encoder, the SDE24 or HDE24 MPEG Encoder Solution for QAM Modulation. The DRMM12 is a rack tray which holds up to 8 of any Mini Rack Digital Product. This modular approach allows the system to be expanded one product at a time instead of requiring the purchase of more capacity than desired. Up to 8 Mini Rack Digital Products may be powered by the PS8 power supply which also mounts in the DRMM12 rack tray. Drake’s DSE 2 PLUS is a dual multiplexing encoder based off of Drake’s industry-leading DSE24 High Definition Digital Signage Desktop Encoder. The DSE 2 PLUS encodes up to two uncompressed programs derived from devices with HDMI, High-Resolution Component Video or VGA outputs. The DSE 2 PLUS encodes the incoming programs to MPEG2 or MPEG4/H.264 compressed video. An internal multiplexing QAM modulator and low-noise upconverter allows existing legacy fiber/coaxial networks to be used as distribution channels for digital signage content. This provides instant access to an extensive network of digital displays capable of viewing valuable advertiser based or informational video in a vibrant “High Definition” format. This is a dual mount rack panel that holds 2 DSE24’s and 1 rack space (1RU). During the past five years, millions of digital flat panel television displays have been placed where we work, shop, vacation, educate ourselves and even where we sleep. Most display devices deployed in these locations receive content via a traditional coaxial CATV type distribution network. The intent of facility owners such as in the hospitality industry is to create a home environment for their customer. Savvy entrepreneurs have come to realize there is an opportunity to offset the costs of digital flat panel displays by allowing advertisers access to these units for targeted messaging directly to consumers while they engage in activities away from home. Drake introduces a high quality and affordable solution that uses the legacy coaxial cable network to connect digital signage content providers with millions of existing flat panel displays where consumers are most likely to view them. Drake’s DSE24 will encode a single uncompressed program derived from devices with HDMI, Component Video or VGA outputs to HD MPEG2 video. An internal QAM modulator and low noise upconverter allows existing legacy fiber/coax networks to be used as distribution channels for digital signage content. This provides instant access to an extensive network of digital displays capable of viewing valuable advertiser based or informational video in a vibrant “High Definition” format. The DSE24 comes in a convenient desk top package. The DTD1000 input module tunes any 8VSB or QAM channel between 54 and 1002 MHz, making it ideal for digital channel processing applications where a single digital video signal is received, error-corrected, clocked (at a user determined fixed rate) and re-modulated on the same or another RF channel. The Drake DTS860 ATSC 8VSB/QAM Demodulator provides digital demodulation for ATSC 8VSB broadcast or in-the-clear QAM television signals. The DTS860 delivers a DVB-ASI transport stream output. This stream will contain all programs present on the selected RF channel. The DTS860 is packaged in an extruded aluminum module that is compatible with the Drake RMM12 or RMM4 rackmounting units normally used for our analog mini-rack components. The modules are one unit wide and thus take one of 12 available slots in the RMM12. The DTS860 modules may be intermixed with analog modulators from the Drake VMM minirack series, all powered by a single PSM121. The DUC864A upconverter is designed specifically to upconvert a 44 MHz IF signal, modulated by a digital signal utilizing either 8-VSB or QAM modulation, without degradation to the digital transport stream that is ultimately recovered. The DUC864A can supply an output on any channel between 54 and 860 MHz. CATV or broadcast channel plans may be selected by a front panel switch. The DUC864A is packaged in an extruded aluminum case to be utilized with other Drake Digital component series products. The Drake EEG-QIP (Enterprise Edge Guide with QAM and IP output) along with the CHIC (Content Hotel Information Carousel) software allows for a content service provider to offer a custom flip-page hotel-guide channel for the hotel’s unique channel lineup. The CHIC sends the hotel-guide data to the EEG-QIP over any QAM channel on the RF network for the hotel property, without the expense of a third-party IP option. The EEG-QIP, based on information in the user configuration file, controls the placement of the guide data information onto a custom MPEG-2 encoded channel that displays the flip-page hotel guide. The custom-channel output is available in both IP and QAM formats. The Drake HDE24A high-definition encoder module generates an MPEG2 or MPEG4 (H.264) video stream, with Dolby® AC3 or MPEG1 layer 2 audio. This module is designed to be installed into Drake’s EH24A or MEQ1000A-style chassis which provides the control and output interface to the unit. This configuration of encoder module and host chassis provides the ultimate in bandwidth management and economy by allowing multiple HD and SD streams to be multiplexed together dependent upon the limitations of the bandwidth of the chosen output: QAM and/or ASI (see EH24A and MEQ1000A manuals for more information on multiplexing). The HDE24A high-definition encoder accepts non-encrypted HDMI or component video inputs and can inject closed-captioning data from a synchronized composite video source (typically provided by the same decoder that produces the HD video stream). Composite analog audio inputs provide the audio source when component video inputs are used. Typically HDMI has embedded audio but if the HDMI is derived from a source converter that does not provide audio, such as DVI-to-HDMI, then the analog composite inputs may be used. The Drake IPI1000 is designed for IP stream acquisition for the MEQ1000A/B multiplexing QAM modulator. The IPI 1000 installs in either rear panel input bay of a MEQ1000, MEQ1000A or MEQ1000B. Programming is via the front panel or Drake Digital Headend Control Program for the MEQ1000/A and the ethernet GUI for the MEQ1000B. The IPI1000 allows you to add IP streams to custom QAM multiplexes from the MEQ1000. The LBS2250 accepts inputs from and supplies power to two LNBs. LNB inputs can be directed by programming to ten front panel outputs which in turn feed Drake SCTx860 series transcoders. Powered and controlled by the PS151 Power Supply. Combines ten output signals from transcoders. The Drake Digital MEQ1000A is the industry’s first commercial-grade, multiplexing Hybrid QAM modulator. Ideal for applications where a single QAM output is required from each Hybrid QAM chassis, the MEQ1000A features a variety of plug-in input modules including an ATSC/QAM input tuner, a QPSK/8PSK input tuner, an ASI input, an IP input (future release), as well as a full selection of digital SD and HD encoder modules, bringing an unprecedented level of flexibility to cable operators. The MEQ1000A has bays for up to two input modules. The video content from both modules enters the main chassis where it is MPEG program-filtered, multiplexed, and groomed. Any number of program streams may be sent to the QAM modulator for Output and/or be exported via the MEQ1000A’s ASI Output. The R.L. Drake model MQM6000L is a professional quality, digital headend modulator that accepts one to six single or multiprogram transport streams via six BNC, Asynchronous Serial Input (ASI) connectors. When six streams are input, the MQM6000L then multiplexes one program from each input and applies the result to the QAM modulator and up converter for output onto any desired CATV or off-air output channel between 54 and 1002 MHz. A program filter is provided to allow selection of the desired program from each input stream. Other programs in the incoming streams are dropped. Front panel display and buttons allow easy setup and monitoring of operating mode and parameters. +40 dBmV output, QAM modulator and very low phase noise agile upconverter are built in. Output is agile on CATV or broadcast channels from 54 to 1002 MHz. TS Multiplexer for MPEG2 transport streams. Programs may be MPEG2 or H.264. MPEG program and minor channel number offsetting when multiplexing. Major channel number pass through or remarking is selectable when multiplexing. Rewriting of the MPEG tables is provided when two input streams are multiplexed. PCR correction is performed when necessary. RS232 remote control and monitoring capability with the included Drake Digital Headend Control Software. High MER output signal quality. 1U tall package with internal power supply conserves rack space. The OBM100 is an out of band data modulator for use with the SCT2X4 headend satellite to cable transcoder. The purpose of the OBM100 is to provide a one-way data channel from the headend to a universe of set top boxes that are being served by the headend. Usually program guide and conditional access control information will be sent through this channel. The OBM100 provides two functions in the data management process. First of all it accepts an ASI transport stream from the SCT2X4 data output connector. This is data that is sent over the satellite path to the headend. The OBM100 takes this low data rate stream and without making any changes to the data, outputs the data through an Ethernet connection to the headend control PC. After the headend PC constructs a complete data stream for the set tops, derived from the satellite delivered data and from locally generated data, the resulting stream is output from the headend control PC back to the OBM100 on the same Ethernet cable that is passing the satellite delivered data in the other direction. The OMB100 accepts this incoming data and performs its second function – transmitting this data stream to the set top boxes. The OBM100 generates a QPSK modulated signal, modulated by the data stream from the headend controller, at a data rate of approximately 3 Mbps. This signal is upconverted to any operator-selected frequency between 70 and 130 MHz for transmission throughout the cable plant. The Drake PEG-NE24-IP and PEG-NE24-IP-C are stand-alone MPEG-2 or H.264 digital video encoders with IP-encapsulation via SFP output port. The PEG-NE24-IP encoder is equipped with a single SDI input, where the PEG-NE24-IP-C also comes with composite video along with left and right audio inputs. On both encoders, a second RJ45 10/100 Ethernet port is provided for control and monitoring. Video encoding is available in MPEG-2 or H.264 formats. The PCM-embedded audio from the SDI source can be encoded to either Dolby® Digital, MPEG1-Layer 2 stereo, or AAC stereo. The PEG encoders are capable of outputting resolutions of 480i, 720p, and 1080i. Powered by a separate 110V AC power unit, the PEG encoder is a small, modular, desktop model. The Drake® QM1000 QAM Modulator with Upconverter is a professional quality modular digital headend component designed to provide optimum performance with minimized rack space requirements. This modulator accepts a MPEG2 transport stream input in an ASI serial format and is capable of providing a QAM output with 64 or 256 constellation points. The SCT2X4 includes two satellite tuners and demodulators that are used to recover an IP encapsulated, MPEG2 transport stream from the satellite-downlinked transmissions. The SCT2X4 can demodulate QPSK signals with various FEC modes and it can also demodulate 8PSK modulation using DVB-S2 FEC. After demodulation and deencapsulation, all of the single program MPEG2 transport streams (MPEG2 or MPEG4/H.264 payload) from the received satellite transmissions, from one or two transponders, are listed so that the user can select desired program streams and map each program to one or more of the four output QAM channels. The programming of the program filter may be conveniently accomplished by means of a RS232 user interface and PC. After this program filtering, a multiplexer section combines selected programs into a multiprogram transport stream, one for each of the four outputs. The data rates are such that when the satellite transmissions are 8PSK with DVB-S2 FEC, the programs from two transponders will usually require four QAM output channels if all programs are selected. The satellite delivered streams end up with quite a bit of timing jitter when the IP encapsulation process is used at the uplink. The SCT2X4 contains special circuitry that is used to reduce this jitter to an acceptable level for MPEG delivery. The SCT2X4 does not alter the scrambling that is likely to be in place on the program streams. The scrambled streams pass intact through the transcoder and are delivered to the set top box where the descrambling will occur. The SCT2X4 does provide a data output that can be used to direct satellite delivered data, such as EMM streams, to the local headend. Usually a local headend controller will process this data and a Drake OBM100 Out of Band Modulator will be used to send data from the headend controller to the set top boxes. The SCT2X4 also provides an ASI input where additional locally generated programs can be input. This allows these programs to be added to one or more of the output multiplexes, as selected by the user. These programs may be MPEG2 or H.264 transport streams that have been encoded with a local MPEG encoder. The SCT2X4 may be remotely monitored and controlled via its RS232 interface. The SCTeci Ethernet Control Interface may be used to provide an IP interface for all SCT2X4 units that are being used in the headend. The SCT2X4 is a Satellite to Cable Transcoder that includes two satellite tuners and demodulators that are independently tuned and demodulate two satellite transponders. Each tuner has its own L band input so that choices are not limited to one polarity or satellite. The SCT2X4 is designed mainly to recover MPEG2 or H.264 video from the satellite-downlinked transmissions. This model is configured to receive 8PSK modulation with DVB-S2 FEC. After demodulation, the correct programs will be directed to the correct QAM channels automatically based upon the transponder selection. SAT 1 programs are directed to QAM1 and QAM 2 while SAT 2 programs are directed to QAM3 and QAM 4. The data rates are such that when the satellite transmissions are 8PSK with DVB-S2 FEC, the programs from two transponders will usually require four QAM output channels if all programs are selected. Four high performance QAM modulators, with up to + 55 dBmV output level per QAM, after combining of the 4 QAMs, are included. The SCT2X4 does not alter the scrambling that is likely to be in place on the program streams. The scrambled streams pass intact through the transcoder and are delivered to the set top box where the descrambling will occur. The SCT2X4 does provide a data output that can be used to direct satellite delivered data, such as EMM streams, to the local headend. This output is active only if your system is designed to use this feature. The SCT2X4 also provides an ASI input where additional locally generated programs can be input. This input is only usable if your system is designed to use this feature. The SCT2X4 may be remotely monitored and controlled via its RS232 interface. Each SCT3860 module may be easily mounted or removed from the RMT150 rack tray to provide for easy expansion or maintenance. Rapid programming for HITS and DISH Network transponders using factory stored preset programming configurations with auto seeking configuration for DISH Network transponders. Auto Seeking configuration for DISH Network transponders. High output power of +40 dBmV which may be locally or remotely monitored and adjusted. LCD for monitoring and setup from the PS151 power supply. Displays QPSK or 8PSK S/N , data rate, output level in dBmV, and other operational data. Operates in DVB or DigiCipher® II modes. QAM output may be programmed in 16, 32, 64, 128, or 256 QAM modes. Bandpass flatness and phase noise are very closely controlled to insure a high MER and S/N ratio. Can be used with standard or stacked LNB installations. Forced air cooling in the RMT150 rack mount tray allows for cool operation even when mounted adjacent to other components. Fans are easily maintained from the front panel. CW output test mode available. Recommended Accessory: LBA2030 L band amplifier. Recommended Accessory: LBS2250 L Band Splitter with LNB switching and output combiner. The R.L. Drake SCT4860 transcoder module is a professional quality, modular, digital headend component providing QPSK or 8PSK to QAM transmodulation and RF upconversion functions in a single module. It receives a wide bandwidth QPSK/8PSK input signal from a satellite transponder, demodulates the digital signal, and resends the recovered MPEG2 digital transport stream through the cable system via a much narrower bandwidth QAM modulated signal. The end user normally utilizes a set top decoder authorizing the programming to be received. The SCT4860 transcoder module populates the RMT150 rack tray which holds up to ten transcoders. This modular approach allows the system to be expanded one transcoder at a time instead of requiring the purchase of more capacity than desired. Up to ten SCTx860 transcoders may be powered by the PS151 power supply which also mounts in the RMT150 rack tray. The PS151 power supply also serves as an RS232 communications link for the remote control of up to 70 SCT series transcoders. The SCT4860 accepts RF inputs between 950 and 2150 MHz from an LNB at the satellite dish. The transcoder then demodulates one QPSK or 8PSK satellite transponder signal and utilizes forward error correction (FEC) to retrieve an error free digital transport stream containing the desired digital multiplex programming. If a fixed output clock rate has been selected, the null packets in the transport stream are processed to provide the selected rate. When required, PCRs are recalculated. The SCT4860 transcoder then applies a cable environment FEC to this stream and remodulates it in the QAM format occupying a standard 6 MHz cable channel. QAM modes up to 1024 QAM are supported. Any standard CATV output channel (EIA, IRC, or HRC CATV) or broadcast off-air channel may be selected from 54 to 860 MHz. Bandpass flatness and phase noise are very closely controlled in the SCT4860 to insure a high MER and S/N ratio of the output signal. Because the MPEG2 transport stream information is not modified by the SCT4860 transcoder, all encryption, authorization, and program guide information is passed to the subscriber unchanged. Although all programming for the SCT4860 transcoder module can be performed at the front panel of the PS151 power supply, the SCT4860 transcoder and PS151 Power supply operate together to provide an RS232 remote control interface which can be accessed by a personal computer. This can be locally or via a modem. Two DB9 connectors on each PS151 power supply provide remote access to up to ten transcoders in that rack tray and permit “daisy chaining” the RS232 cables between multiple power supplies. Up to 70 SCTx860 transcoders in a headend can be monitored or controlled by a single connection. Configuration changes via remote control access can be password protected. RS232 remote control software is provided with each PS151 power supply. A personal computer with the remote control software installed has the ability to control multiple headends. Up to 64 SCT860 transcoders and PS100 power supplies can be controlled in the same headend as the SCTx860 units with the same RS232 control link and software. Additionally, the SCT4860 may be controlled over a local area network or the Internet with the addition of the optional SCTeci ethernet controller interface (click for details). Each SCT4860 module may be easily mounted or removed from the RMT150 rack tray to provide for easy expansion or maintenance. Rapid programming for HITS and DISH Network transponders using factory stored preset programming configurations with auto configuration for DISH Network transponders. Easy to read, backlit LCD for monitoring and setup from the PS151 power supply. Displays QPSK or 8PSK S/N , data rate, output level in dBmV, and other operational data. Null packet processing and PCR correction built in. Fixed or auto output clock modes are selectable. QAM output may be programmed in 16, 32, 64, 128, 256, 512 or 1024 QAM modes. Bandpass flatness and phase noise are very closely controlled to insure the high MER and S/N ratio required for 1024QAM operation. The R.L. Drake SCTeci is a professional quality digital head end Ethernet control interface which communicates with the Drake family of transcoders via their respective RS232 serial interfaces. The SCTeci then acts as a Ethernet server allowing a remote computer to access the data through the Internet or local area network using a standard web browser. Each SCTeci has its own individual MAC address. One SCTeci is utilized for all SCT family transcoders in a headend. The front panel features status lights as well as a front panel LCD display for programming and status monitoring. Access to the SCTeci can be password protected to prevent unauthorized access or programming changes. The SCTeci is compatible with the following transcoders when used with the PS100 or PS151 power supplies: SCT860, SCT1860, SCT2860, SCT3860, and SCT4860. The SDE24A module can encode up to two input sources, source 1 and source 2 in real-time. The module may be configured to encode both sources 1 & 2 in either MPEG2 or MPEG4 (H.264) transport streams. Thus each Encoder Module can output one MPEG2 stream, two MPEG2 streams, one MPEG4 stream, 2 MPEG4 streams or one MPEG2 and one MPEG4 stream. Each SDE24A module provides two sets of input connectors for NTSC composite with stereo audio. Audio is encoded using Dolby AC-3 encoding. 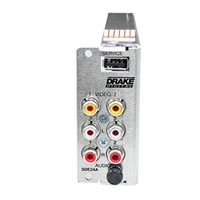 The Drake Digital™ SDE24A Standard Definition Encoder Module receives up to two input sources via NTSC Composite with stereo audio. Input 1 & 2 on the SDE24A can encode analog signals to either MPEG2 or MPEG4 (H.264) transport streams. Each SDE24A Encoder Module can output as one MPEG2 stream, two MPEG2 streams, two MPEG4 stream or one MPEG2 stream and one MPEG4 stream. Audio output is rated as Dolby Digital™ AC-3 compliant.